a "York Peppermint Patty" aftertaste! or the towers? Wait and see! grow better in the rafts or the media beds? green and purple basil is filling out! beds: banana, kumquat, and lemon trees. new demonstration systems. forest of mint from the DWC rafts! Tat-soi are thriving in 20 square feet of space. Feb - We recently cut the top tier off of our two tier system and made it a flood table. This allowed the middle bed to get direct natural light and allowed us a more productive and manageable seedling area. Dec 1 - Added 12 vertical ZipGrow Towers to the Tilapia System. Seeds are starting and will be planted in a few weeks. Water from the main tank is being sent into a secondary storage tank where it is then pumped through the towers and returned back to the secondary tank. This tank then overflows to the main fish tank. Just a little Tilapia feeding at the GrowHaus. They are happy and their water quality is excellent at the moment. We have more fish in this system then we need to support the number of growbeds so we can either expand the growbed volume or reduce the population. There has been an increase in the Tilapia piping for air at the surface after they eat which indicates low DO levels. The available nutrients in the beds are more than enough for the plants so reducing the fish population by as much as half would probably have little to no effect on the plants. August 1, 2011 - This is Steve's home system. It is composed of a 100 gallon fish tank and a 90 gallon grow bed. The two images show the first 8 weeks of plant growth. He has 50 plants growing, including basil, cilantro, celery, chilli peppers, tomatoes, cucumbers, egg plant, tomatillos and ficus. He is also raising 25 bluegill and 9 fancy koi. The fish are being fed a pelleted feed from Silver Cup and their diets are supplemented with duckweed (Lemna minor) that he grows in a 5 gallon bucket outside. He also occasionally adds chelated iron, worm tea and sea kelp as the system needs them. He has placed crushed oyster shells in his fish tank to add alkalinity and help buffer the pH, but when it does fall to 6.0 or below he adds a small bit of either calcium hydroxide or potassium bicarbonate to bring it back up to around 7.0. Since the addition of the oyster shells, the frequency of these additions has dramatically reduced. He has reported tremendous plant growth and his first chili peppers and tomatillos are already forming! May 18th 2011- We just finished cycling our home system and this picture shows two buckets of fish getting ready to transition into their new ho me. We purchased the fish from Liley Fisheries in Boulder. We are stocking the 110 gallon tank with 25 Bluegill and 5 Channel Catfish. 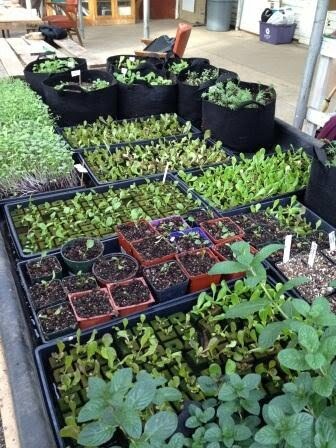 Seedlings are currently growing in a seperate location and will be planted shortly. We cycled the system with small doses of ammonia and sea kelp to help establish the bacterial colony necessary to convert ammonia from fish waste into nitrates for the plants. The system took 31 days to cycle and is now ready to be stocked. We will still closely monitor water quality levels to ensure the fish, plants and bacteria are healthy and not at risk. May 10th - The GrowHaus system is now growing tomatoes along with other crops as we transition into the warmer months. We also harvested 4 large Tilapia for a recent Cinco de Mayo celebration at a local elementary school. 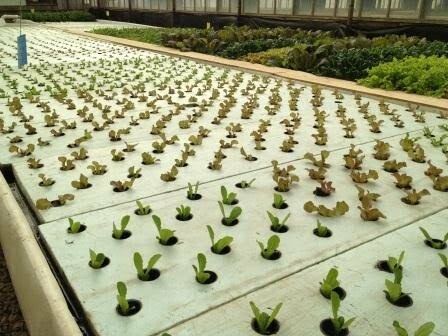 January 25th - Here's some updated pictures from the three Colorado Aquaponics systems at the GrowHaus. The watercress on top of the Trout system is growing out of control. The Trout are very happy, eating well and helping to produce some amazing growth. There are only 20 trout in about 200 gallons of water in this multi tiered system. Slideshow from Dec 11th weekend with Improbable pictures - Here are some more pictures from the 4 day aquaponics video shoot with Improbable pictures. 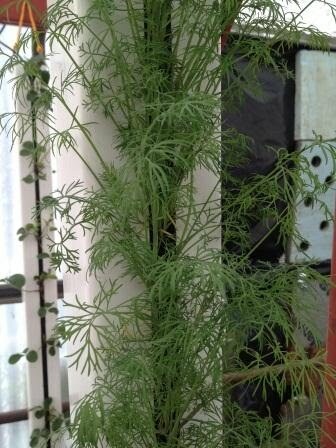 This will be the home aquaponics system feature in the video and also available for purchase in the Spring of 2011. Bench system pics - Dec 12th The plants are doing well and this is actually the second rotation on the raft bed since Oct 25th. We're still messing around with the raft bed and are going to add some more filtration. The mineralization tank is good but it needs an additional solids removal components which we'll be adding next week. We just planted some new seeds in our raft bed today and while fixing some roof panels at the top of the greenhouse I thought I'd take some photos from that vantage point as well. The second photo is Adam Brock planting lettuce seeds in the starter cubes. Below are more photos of our new Rocky Mountain White Tilapia moving into their new tank at the GrowHaus. We brought them up from Mosca Alligator Farm in the back of the minivan. They probably didn't enjoy the tight quarters during the long drive but are now happily adjusting to their new tank. Hands on Workshop - Sept. 25th - Pictures from this weekend's Hands-On Workshop. This class was awesome. Read more about it in our announcements section. GrowHaus Aquaponics and Community Bench System Project - Aug 30th - We've made some decent progress over the past few weeks although time to work on the system is always limited. The greenhouse itself can also get up to 130 degrees during the day which makes work a little challenging. At this point, all of the grow beds have been blocked and framed using all reclaimed materials. In addition, we recently picked up a load of free lava rock which we are in the process of washing and drying in order to experiment with as our media in one of the three grow beds. GrowHaus Aquaponics and Community Bench System Project - Aug 5th - The pictures below show the underground installation of flexible ductwork which will be connected to a duct that runs up to the ceiling of the greenhouse. An in-line vent fan will then draw waste heat from the top of the greenhouse down below the tank to provide a less expensive supplemental heat source for the tank water. The tank will be partially sunk into the ground to provide additional insulation. August 3rd - Our aquaponic system at the GrowHaus is trucking along with lots of growth on the top bed. There are about 20 yellow perch in the tank below eating a combination of vegetation from the plants above and pelleted food. Were going to add more fish after the plants are harvested. We'll likely switch to watercress and herbs for the next growth phase of this system. The first Tilapia harvested. We called him Bob. He stayed alive in a 20 gallon tank (this was not easy and not recommended as this tank was too small and required frequent water changes). He was the Aquaponics Ambassador to Greenspaces for the Denver Green Route event. He also provided nutrients for a small grow bed until it was time to have him for dinner. He made a lovely fish chowder with various herbs from the garden and a nice salad of red ridinghood lettuce (notice the fantastic color of the leaves in this variety of lettuce). This is seven weeks of growth and ready to eat.